Key U.S. senators called Sunday for the White House to be more forthcoming about the country's military involvement in Niger after four U.S. soldiers were killed in an ambush there earlier this month. In separate interviews on NBC's "Meet the Press" news show, Republican Lindsey Graham and Democratic Senate leader Charles Schumer said they support an effort last week by Republican Senator John McCain to find out the details of the attack as well as the scope of the U.S. campaign against Islamic State in the west African country. Both Graham and Schumer said they had been unaware of the substantial number of the U.S. troops in Niger. FILE - Sen. Lindsey Graham, R-S.C. is surrounded by reporters as he arrives at the Senate on Capitol Hill in Washington, July 27, 2017. 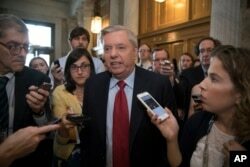 "I didn't know there was 1,000 troops in Niger," Graham said. "This is an endless war without boundaries and no limitation on time and geography. You've got to tell us more. 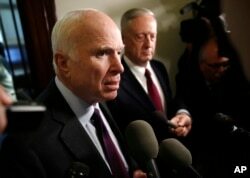 "We don’t know exactly where we’re at in the world militarily and what we’re doing," Graham said. "So John McCain is going to try to create a new system to make sure that we can answer the question, why were we there, we’ll know how many soldiers are there, and if somebody gets killed there, that we won’t find out about it in the paper. 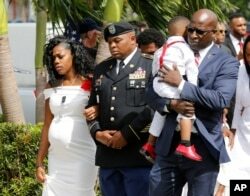 Myeshia Johnson, widow of U.S. Army Sergeant La David Johnson, who was among four special forces soldiers killed in Niger, is escorted into his graveside service in Hollywood, Florida, Oct. 21, 2017. Schumer said, "We need to look at this carefully. This is a brave new world. There are no set battle plans." He said that he would favor revisiting the current congressional authorization for overseas military action that is 16 years old, an agreement stemming from the 2001 terror attacks on the U.S.
"There is no easy answer but we need to look at it," he said. "The answer we have now is not adequate." Sen. John McCain, R-Ariz., left, and Defense Secretary James Mattis, speak to members of the media after their meeting on Capitol Hill in Washington, Oct. 20, 2017. Defense Secretary Jim Mattis told Graham and McCain, the chairman of the Senate Armed Services Committee, last week that the military is shifting its counter-terrorism strategy to focus more on Africa. The defense chief said military leaders want to expand their ability to use force against suspected terrorists. U.S. officials believe the Niger attack was launched by a local Islamic State affiliate, but the Pentagon is still investigating the circumstances of how it occurred.